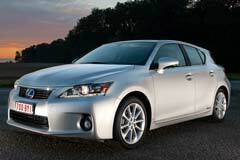 The Lexus CT 200h is a premium hybrid electric 4-door hatchback that has a single trim level. Standard equipment in the used Lexus CT 200h include 17 inch wheels, a sun roof, heated side mirrors, keyless entry and ignition, 10 way power driver seat, leather upholstery, adaptive cruise control, LED headlamps, tilt and telescoping steering wheel, premium vinyl upholstery, dual zone climate control, audio connectivity and Bluetooth phone, 6-speaker sound system, satellite radio, CD player, USB jacks and auxiliary audio. The used Lexus CT 200h has a single power-train choice. It is powered by a 1.8L 4-cylinder engine that has a pair of electric motors. The combination generates 134hp through its continuously variable automatic transmission. Standard safety features include antilock disc brakes, side curtain airbags, front and rear side airbags, traction and stability control and Lexus safety connect. Lexus CT 200h is equipped with soft touch surfaces on contact areas that are most heavily trafficked. It has a luggage space of 14.3 cubic feet. The folding rear seats and hatchback configuration increases its cargo carrying capacity. 2012 Lexus CT 200h -- 2012 Lexus CT 200h, Tungsten Pearl with 42039 Miles available now! 2017 Lexus CT 200h 2017 Lexus CT 200h Nebula Gray Pearl FULLY LOADED!